A huge mist engulfs a small US community. But This is no ordinary mist. Somewhere within, lurking unseen, are a host of terrifying monsters. David Drayton (Thomas Jane) finds himself trapped in a supermarket with his son Billy (Nathan Gamble). He, like the rest of the shop’s inhabitants, doesn’t dare leave. However, he soon questions just where they are safest as tempers fray and inside becomes as dangerous as the mist outside. I am not sure why I missed the release of Frank Darabont's The Mist in 2008. Over the years, I have heard the film mentioned but I have deliberately kept myself in the dark regarding all things plot. In fact, I was completely clueless having not read the movie's source material - a novella by Stephen King. Two nights ago, I felt in need of a horror film. As a result, I decided to give The Mist a try. At first, I was charmed by the film’s B movie feel. I also felt safe in Stephen King territory - the characters and locations were enjoyably familiar, the monsters fun to watch and look there’s Toby Jones! As The Mist progressed, I started to realise that the true horror of this film was not outside but inside the supermarket. Marcia Gay Harden is brilliant as the ultra religious Mrs Carmody who stirs everyone into a fervour. It was interesting and disturbing to see how quickly the rules of society fractured. There are many frightening scenes of mob rule gone mad. 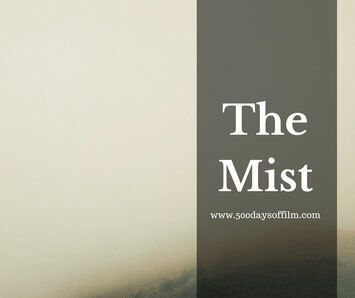 Now, if you were to ask me, ten minutes before the end of The Mist, what I thought of this film I would have told you that it was enjoyable but pretty forgettable stuff. Nothing could have prepared me for this movie's final scenes. I don’t think I have been so stunned at a film’s ending for a long, long time. And I know this film will stay with me now. I won’t (of course) spoil anything for you here (the less you know the better etc) but… woah it’s a real shocker. Thomas Jane gives a powerful and heartbreaking performance. The ending of the movie was director, Frank Darabont’s idea - an idea that Stephen King loved. Darabont initially wanted to release a black and white version of The Mist. This is his preferred version. However, the film studio refused. I haven’t seen this cut of the film but am assured it has the edge on the colour version. I might see for myself once I have recovered! Have you seen The Mist? If so, what did you think of this film? Were you as devastated as I was by the ending? I’d love to know… leave me a comment in the box below!